When Revealed: Each location in the staging area gets +1 Threat until the end of the phase. Then, each player with a threat of 35 or higher chooses and discards 1 card from his hand. Corsair Slaver gets +1 Attack and +1 Threat for each resource on it. 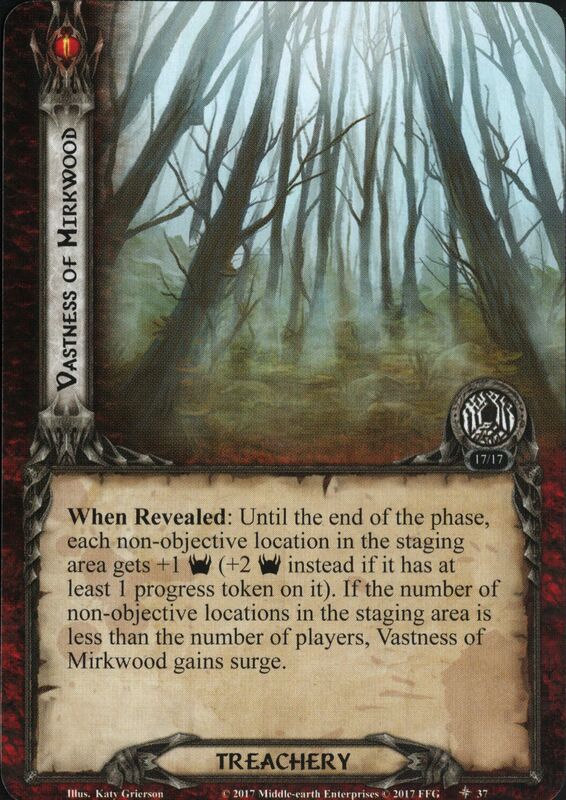 Forced: After the engaged player spends any number of resources, place 1 of those resources on Umbar Slaver. While the temperature is 40 or higher, Burnt Sands gets +2 Threat. 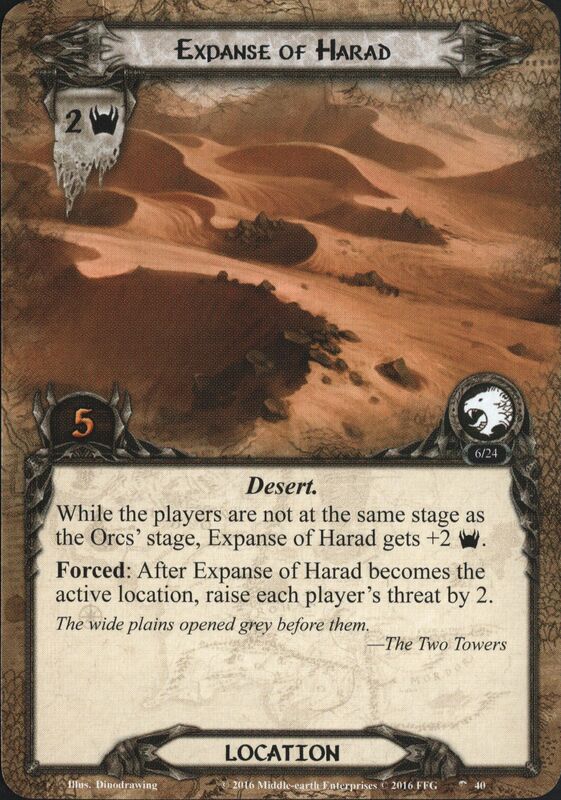 Forced: After Burnt Sands becomes the active location, increase the temperature by 2. 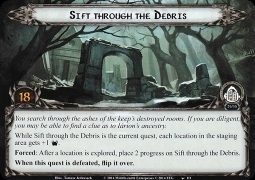 When Revealed: Discard cards from the encounter deck until a Harad enemy is discarded. Add that enemy to the staging area and place a resource token on it. That enemy is "the Champion." While this stage is in play, the Champion gets +2 Threat, +2 Attack, +2 Defense and gains: Immune to player card effects. The main quest stage cannot be defeated while the Champion is in play." The champion cannot take damage unless there are at least 4 progress tokens here. This stage cannot be defeated while the champion is in play. When Revealed: Attach to the highest Threat location in the staging area without a copy of Overgrown attached. (Counts as a Condition attachment with the text: "Attached location gets +1 Threat and gains 'Immune to player card effects.'" Territorial Ape gets +X Threat and + X Attack, where X is the Threat of the active location. 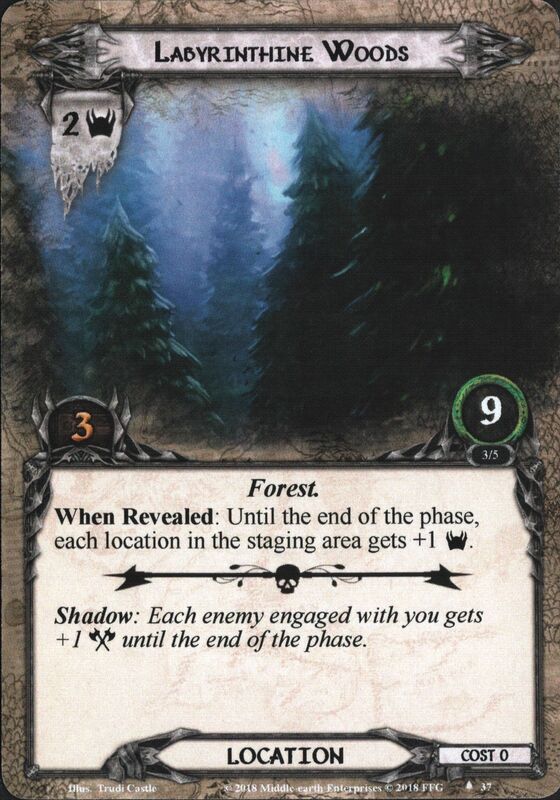 Shadow: Attacking enemy gets +1 Attack (+2 Attack instead if a location was explored this round). Each location gets +1 Threat. 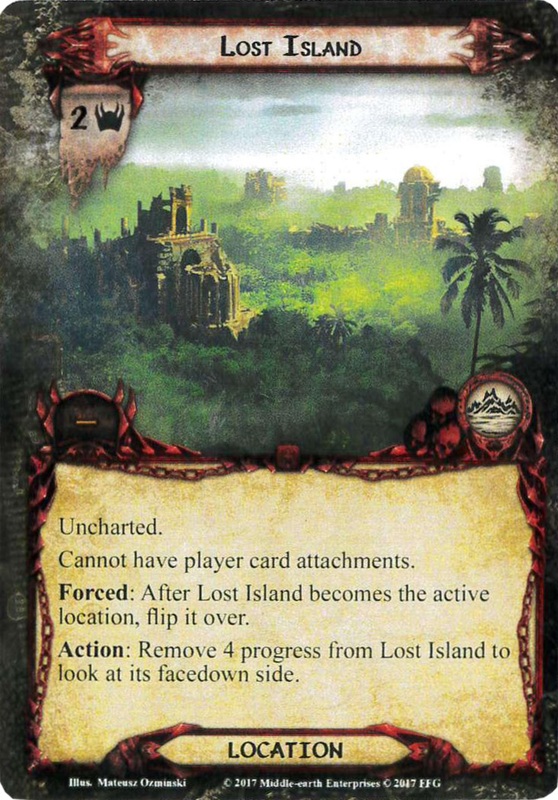 Forced: When Guardians of the Jungle becomes the current quest, search the encounter deck and discard pile for a Territorial Ape and put it into play engaged with the first player. 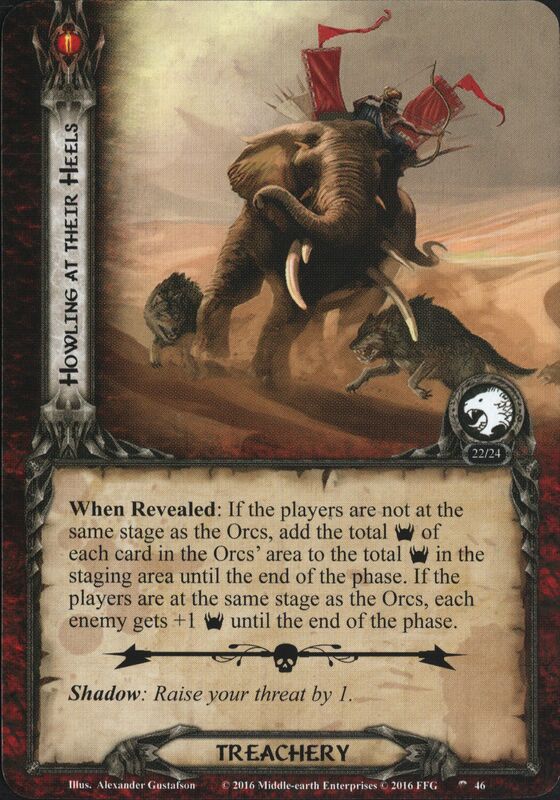 While the players are not at the same stage as the Orc's stage, Expanse of Harad gets +2 Threat. 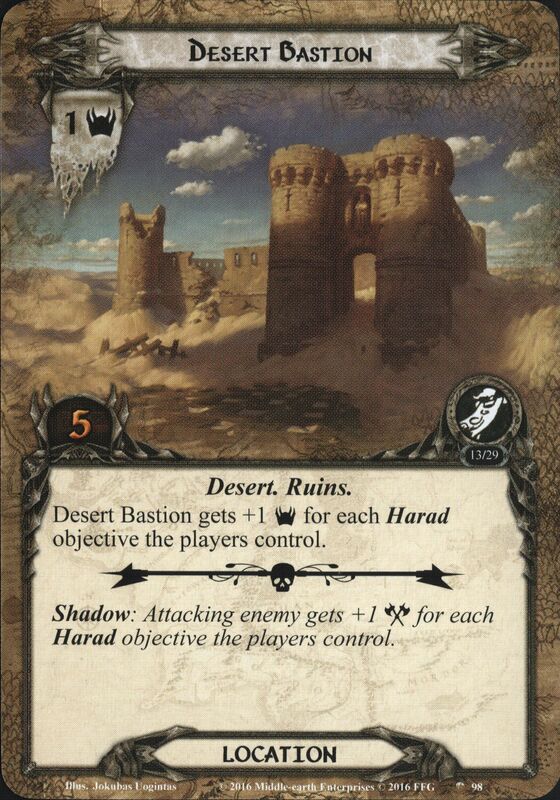 Forced: After Expanse of Harad becomes the active location, raise each player’s threat by 2. 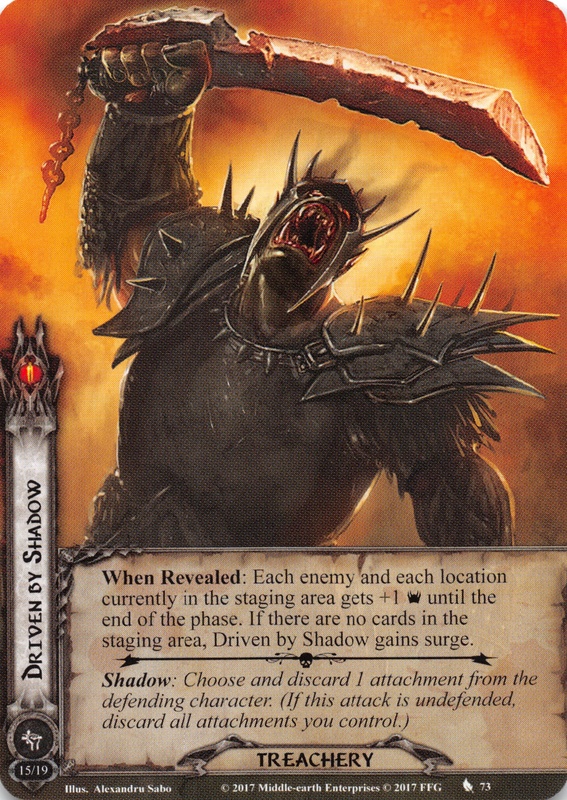 When Revealed: If the players are not at the same stage as the Orcs, add the total Threat of each card in the Orc's area to the total Threat in the staging area until the end of the phase. If the players are at the same stage as the Orcs, each enemy gets +1 Threat until the end of the phase. Shadow: Raise your threat by 1. 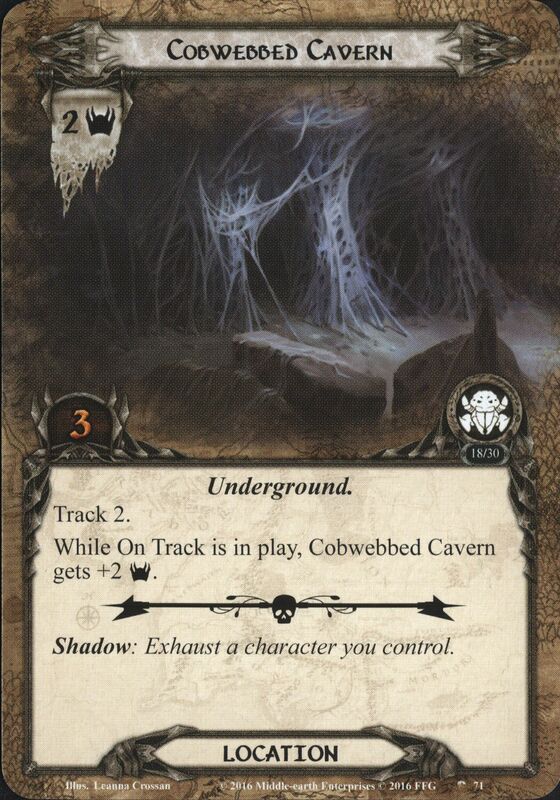 While On Track is in play, Cobwebbed Cavern gets +2 Threat. 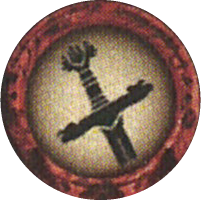 Dungeon Cell gets +X Threat where X is the printed Willpower of the attached objective. 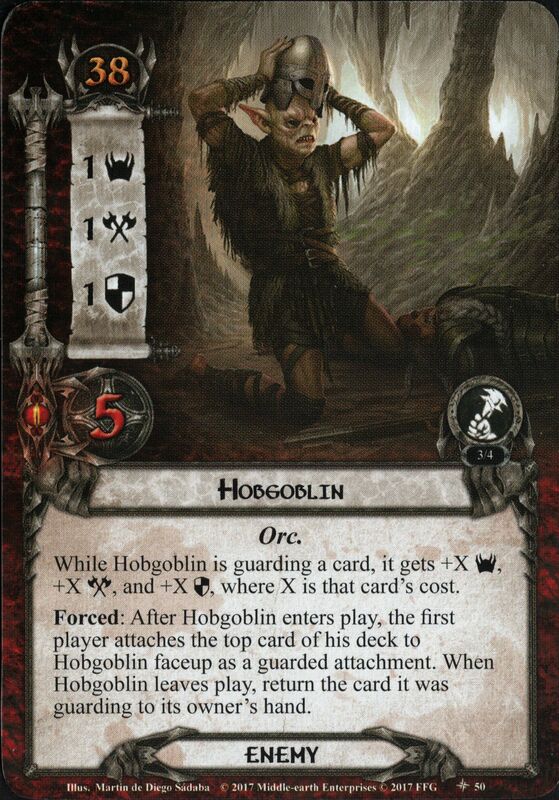 While Dungeon Cell is in the staging area, it gains: "Forced: After an ally is destroyed, attach it to Dungeon Cell if there is no objective attached to Dungeon Cell." Cannot have attachments or take non-combat damage. 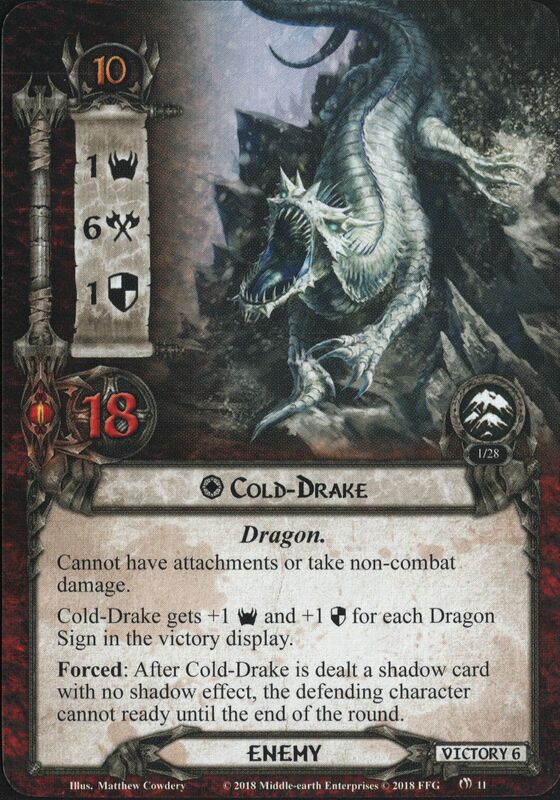 Cold-Drake gets +1 Threat and +1 Defense for each Dragon Sign in the victory display. Forced: After Cold-Drake is dealt a shadow card with no shadow effect, the defending character cannot ready until the end of the round. Cannot have non-objective attachments. Fram's Shade gets +1 Threat, +1 Attack, and +1 Defense for each Loot objective the players control. 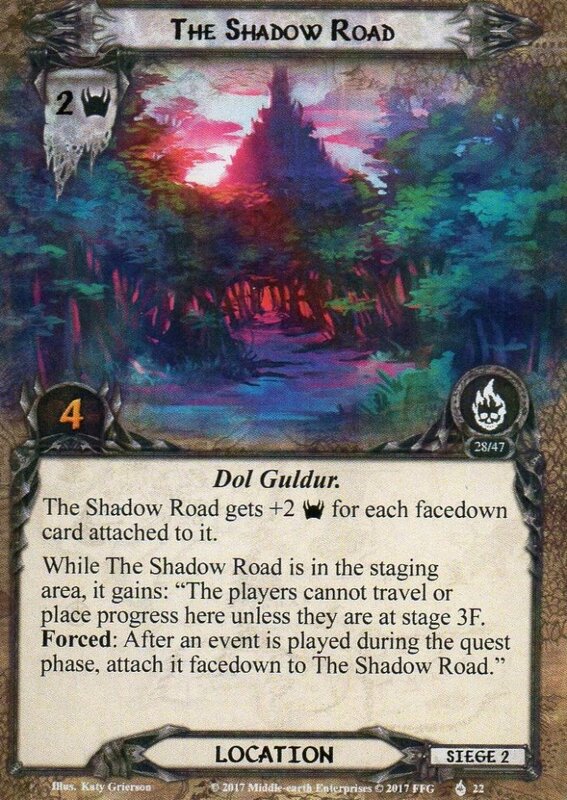 When Fram's Shade is dealt shadow cards, deal it a number of shadow cards equal to the number of Loot objectives the players control (to a minimum of 1). 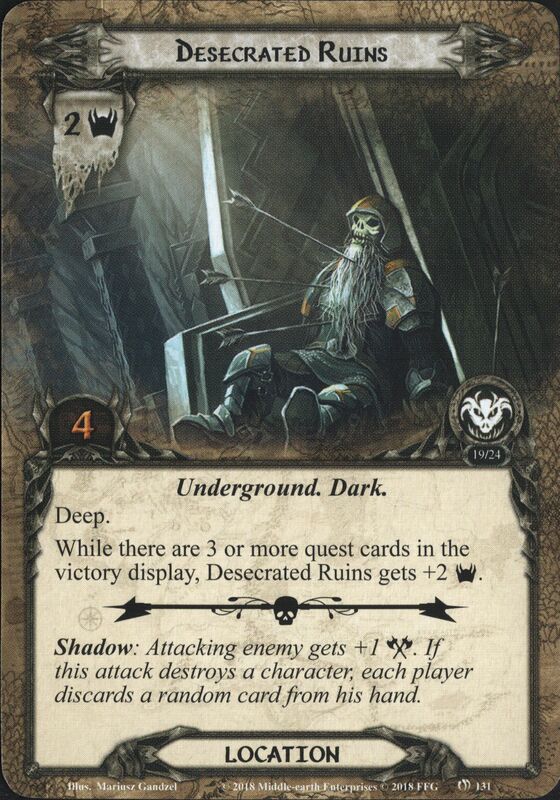 While there are 3 or more quest cards in the victory display, Desecrated Ruins gets +2 Threat. Shadow: Attacking enemy gets +1 Attack. If this attack destroys a character, each player discards a random card from his hand. Many-pillared Hall gets +1 Threat for each Many-pillared Hall in play. 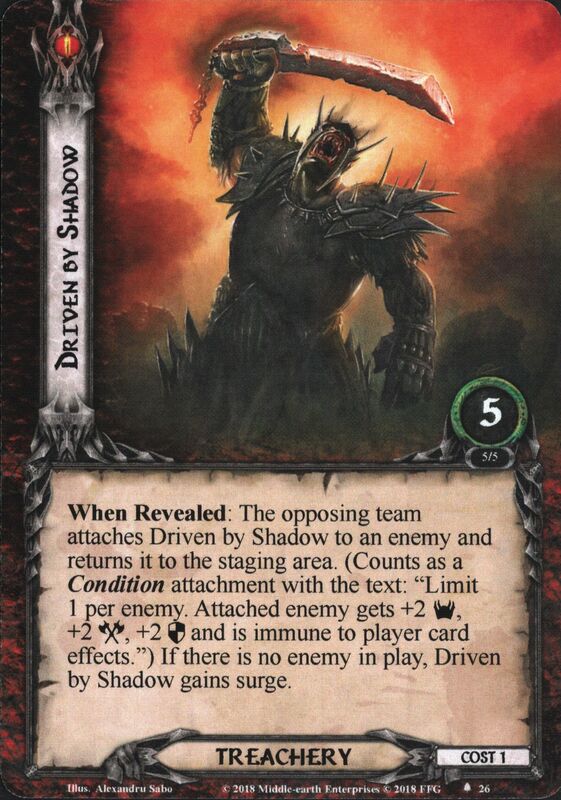 Shadow: Attacking enemy gets +1 Attack (+2 Attack instead if the defending player's threat is 35 or higher). Shadow: Attacking enemy gets +1 Attack. If this attack destroys a character, place 1 progress on the current quest. When Revealed: Each Ship location in the staging area gets +1 Threat until the end of the phase. If there are no non-unique Ship locations in the staging area, search the encounter deck and discard pile for a Ship location and add it to the staging area. Shuffle the encounter deck. Immune to player card effects. The players cannot travel here. 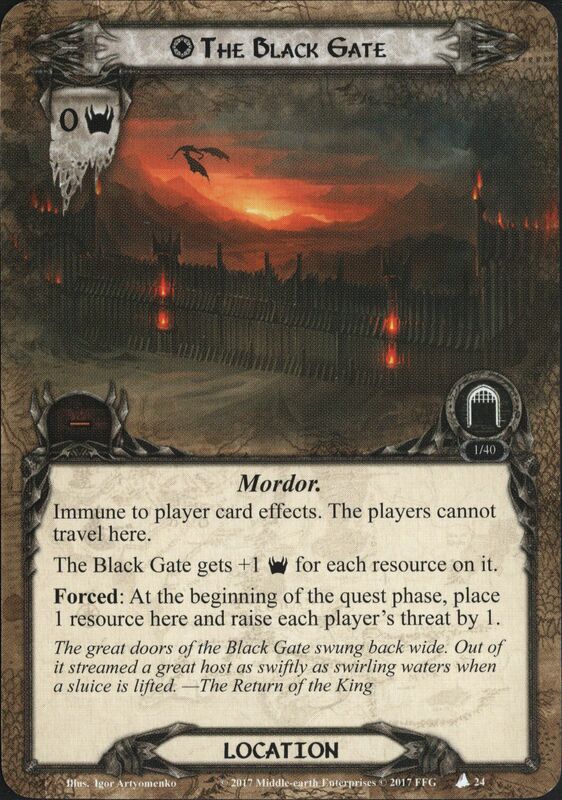 The Black Gate gets +1 Threat for each resource on it. Forced: At the beginning of the quest phase, place 1 resource here and raise each player's threat by 1. 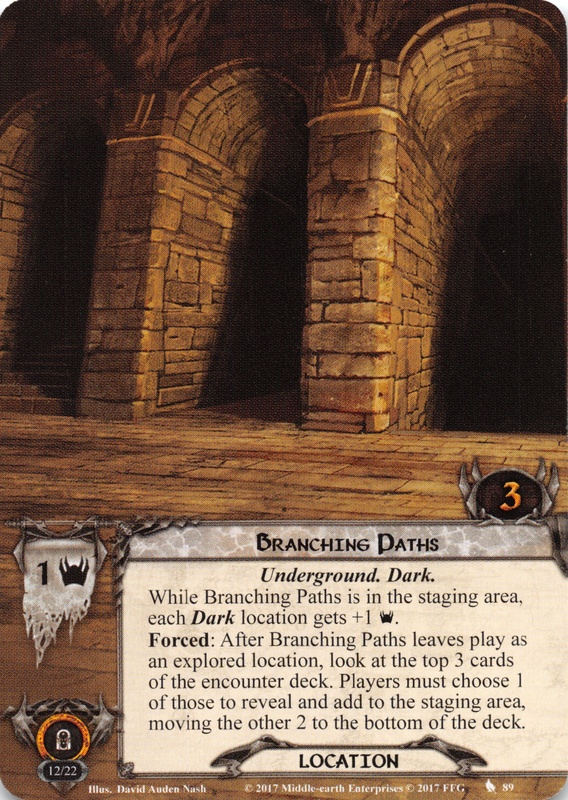 While Branching Paths is in the staging area, each Dark location gets +1 Threat. 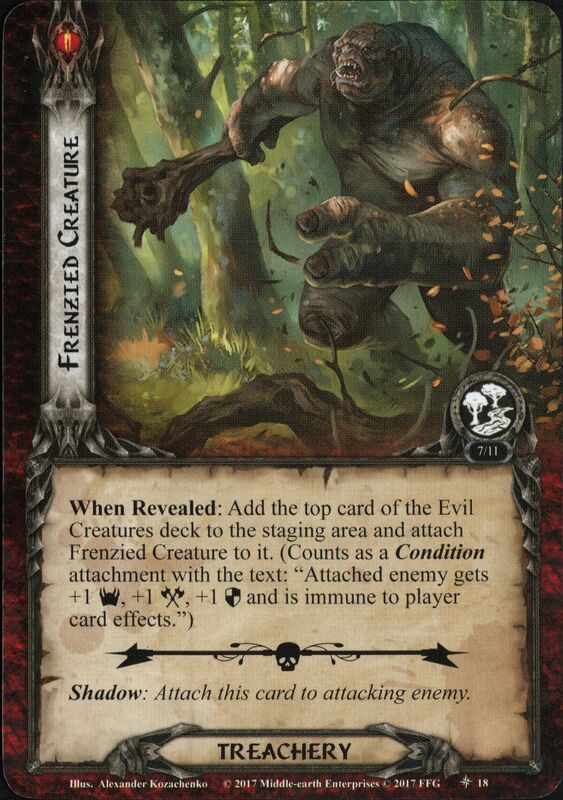 Forced: After Branching Paths leaves play as an explored location, look at the top 3 cards of the encounter deck. 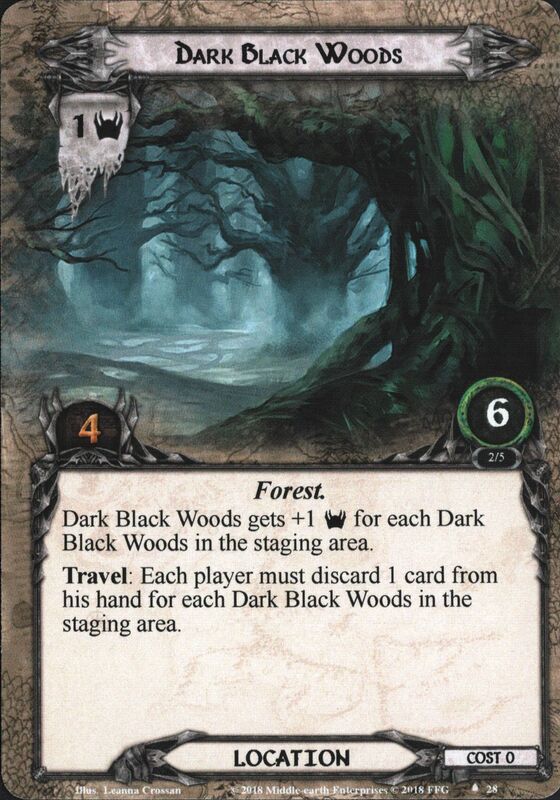 Players must choose 1 of those to reveal and add to the staging area, moving the other 2 to the bottom of the deck. If the players have crossed the Anduin, Captured Watchtower gets +3 Threat. Shadow: Remove all defending characters from combat. This attack is considered undefended. 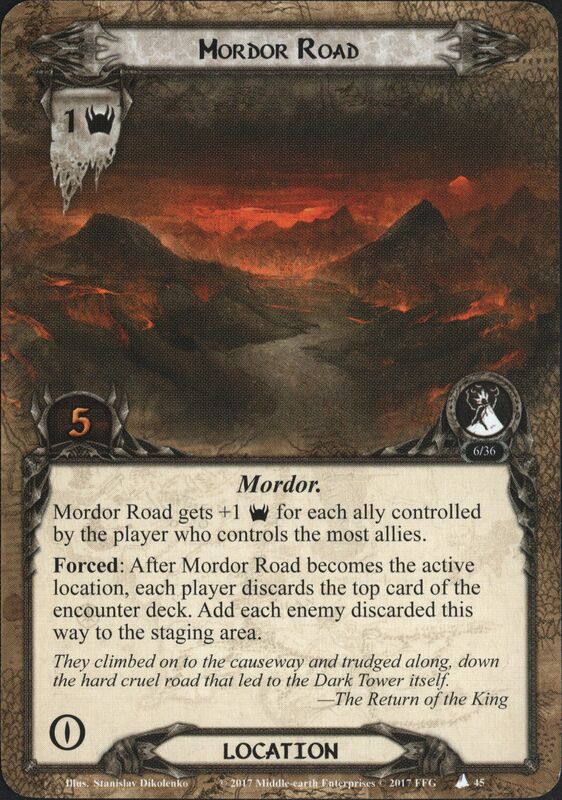 If the players have not crossed the Anduin, Ruins of Osgiliath gets +3 Threat. Shadow: If this attack destroys a character, resolve all burn damage on locations in play. Dusk. Shadow of Dwimorberg gets +2 Threat. Midnight. Shadow of Dwimorberg gets +4 Threat. Dusk. Whisperer gets +1 Threat. Midnight. Whisperer gets +2 Threat and gains Doomed 2. 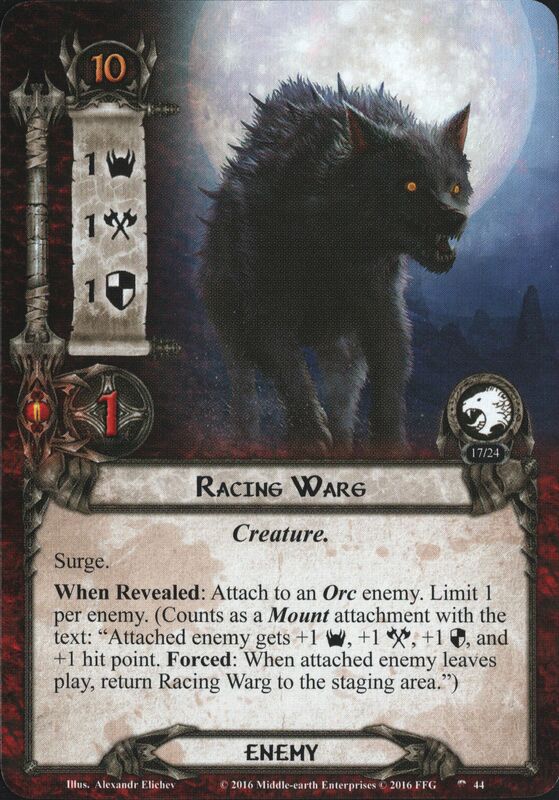 Orc Interceptor gets +1 Threat and +1 Attack for each resource token on it. 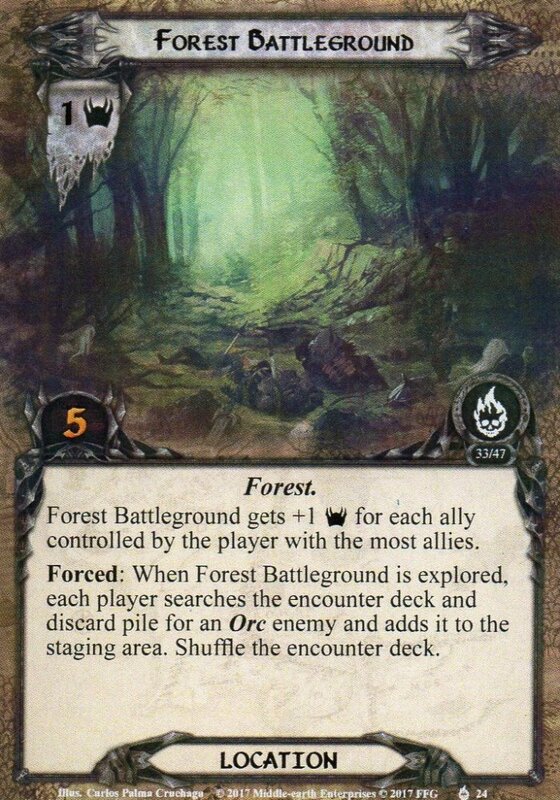 Forced: After a location leaves play as an explored location, place a resource token on Orc Interceptor. 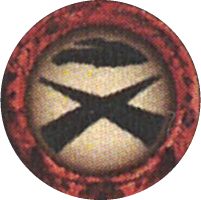 Overseer Maurûl gets +X Threat, +X Attack and +X Defense, where X is the highest number of resources on a Goblin enemy in play. 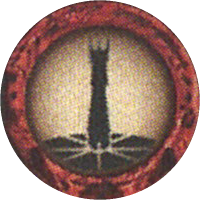 The Players cannot win the game unless Overseer Maurûl is in the victory display. Forced: When an engaged enemy with the ambush keyword engages a player, Treacherous Bluffs gets +2 Threat until the end of the phase. 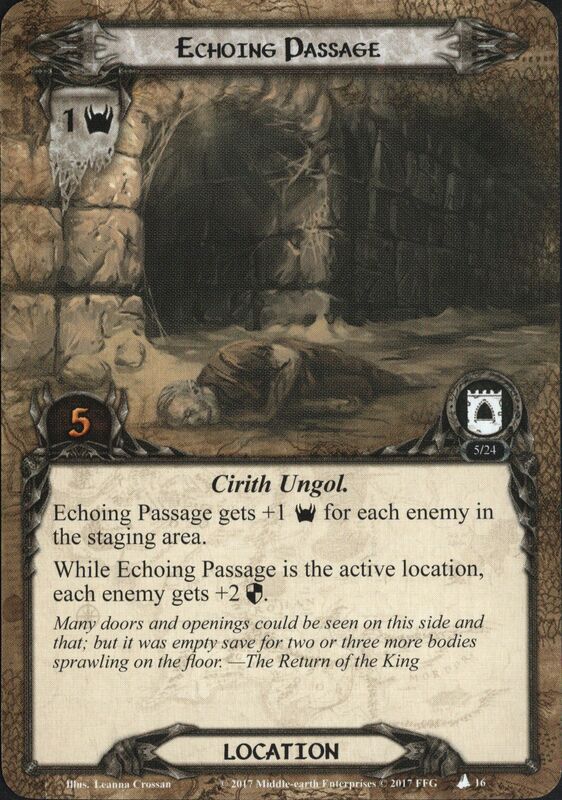 Shadow: Excess damage dealt by this attack must be assigned to Arwen Undómiel. 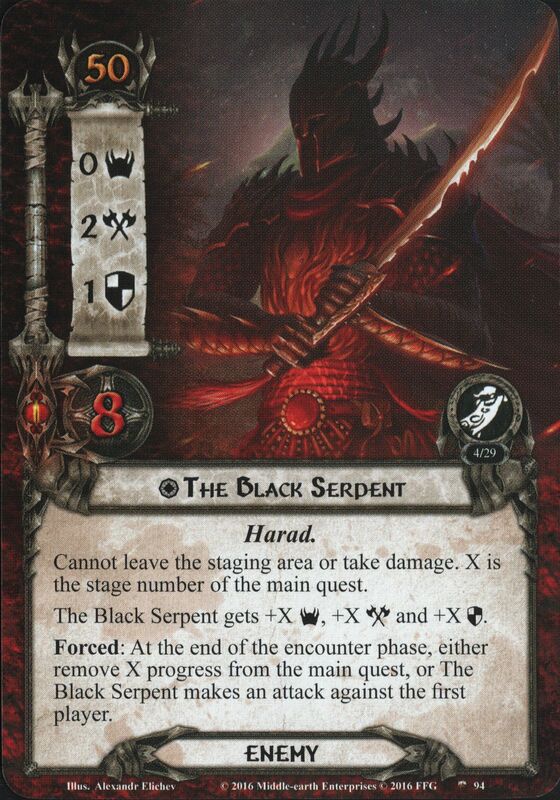 While the current quest has battle, Haradrim Marksman gets +2 Threat and gains archery 2. While the current quest has siege, Haradrim Marksman gets +2 Attack and allies cannot be declared as defenders against its attacks. While the current quest has battle, Cormallen Fields gets +2 Threat. 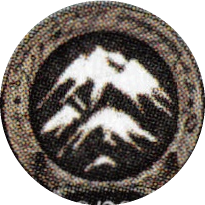 While the current quest has siege, when faced with the option to travel, the players must travel to Cormallen Fields, if able. Immune to player card effects. Palace Remains gets +1 Threat for each resource token on it. 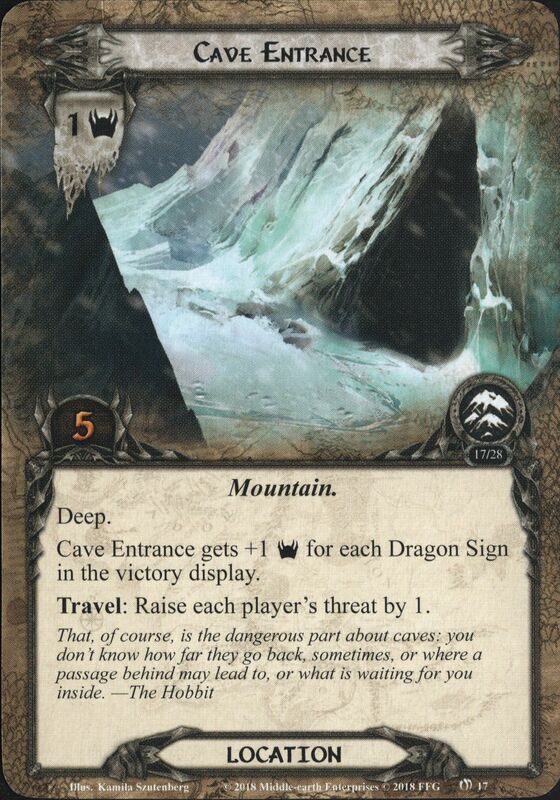 The players cannot travel here unless there are at least 5 resource tokens on Palace Remains. While Palace Remains is in the staging area, it gains "Forced: After a player takes control of a location, place 1 resource token here." If Raven's Guardian is in play or in the victory display, each Raven enemy gets +1 Threat. Forced: At the beginning of the encounter phase, Raven Spirit engages the player who controls Key of the Raven or is engaged with Raven's Guardian, if able. 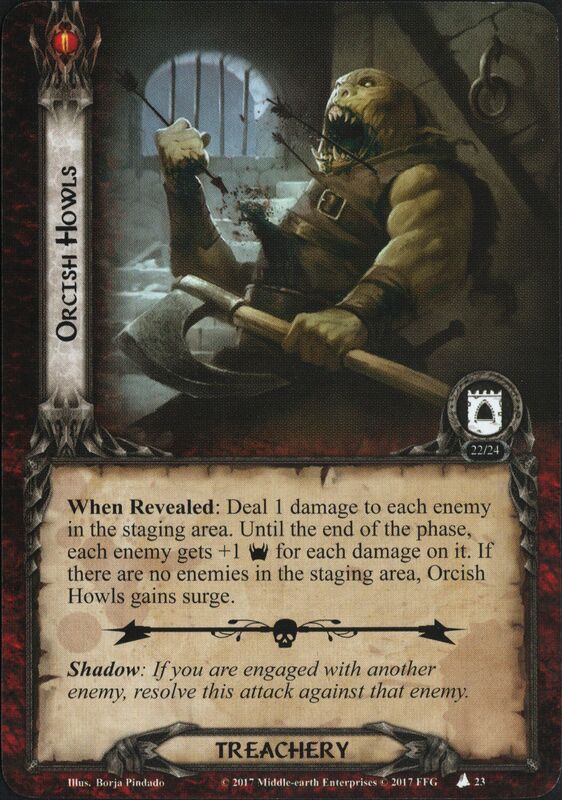 Each copy of Orc War Party cannot be engaged, cannot be dealt damage and gets +2 Threat. When Revealed: Return each engaged Orc War Party to the staging area. Forgotten Courtyard gets +1 Threat for each resource on it. 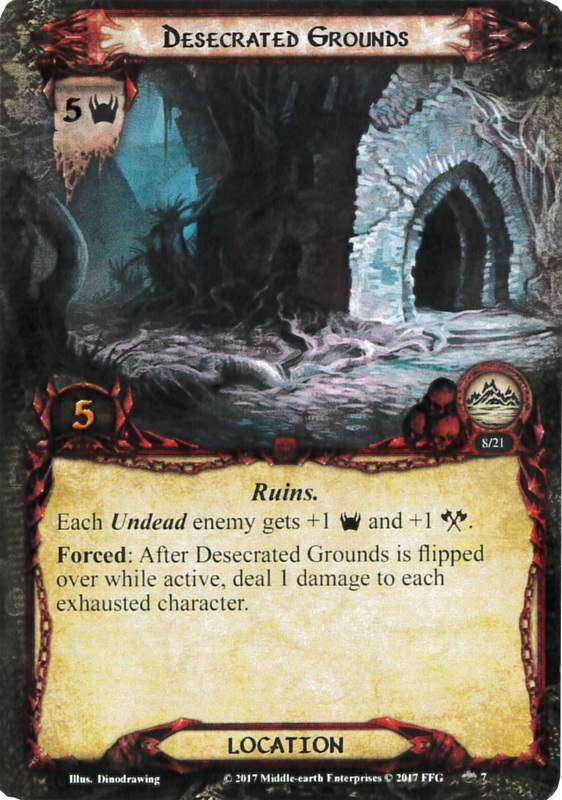 Forced: After an Undead enemy enters play, place 1 resource on Forgotten Courtyard. Corsair Pyromaniac gets +1 Threat, +1 Attack, and +1 Defense for each resource token on it. 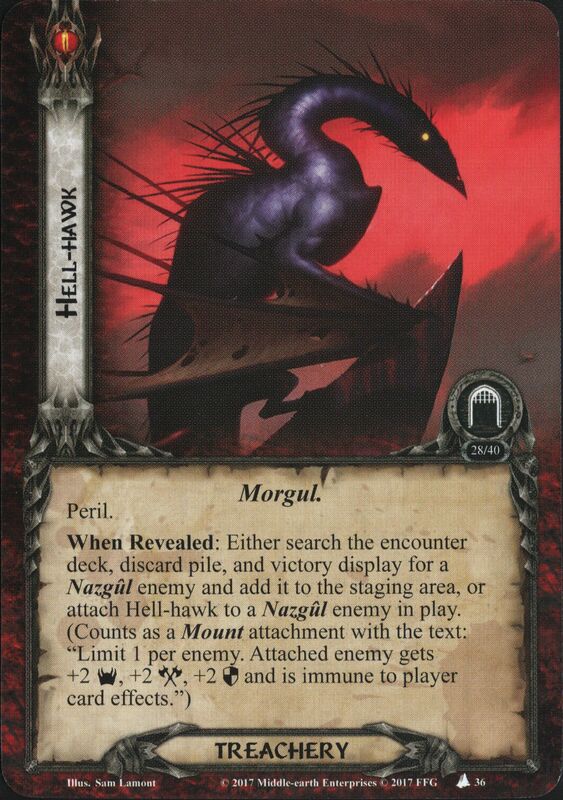 Forced: After a card is placed underneath The Havens Burn, place 1 resource on Corsair Pyromaniac. While the active location is in the top rown, Cursed Soldier gets +3 Threat. While the active location is in the middle row, Cursed Soldier gets +3 Attack. While the active location is in the bottom row, Cursed Soldier gets +3 Defense. Eastfarthing gets +2 Threat for each resource token on it. 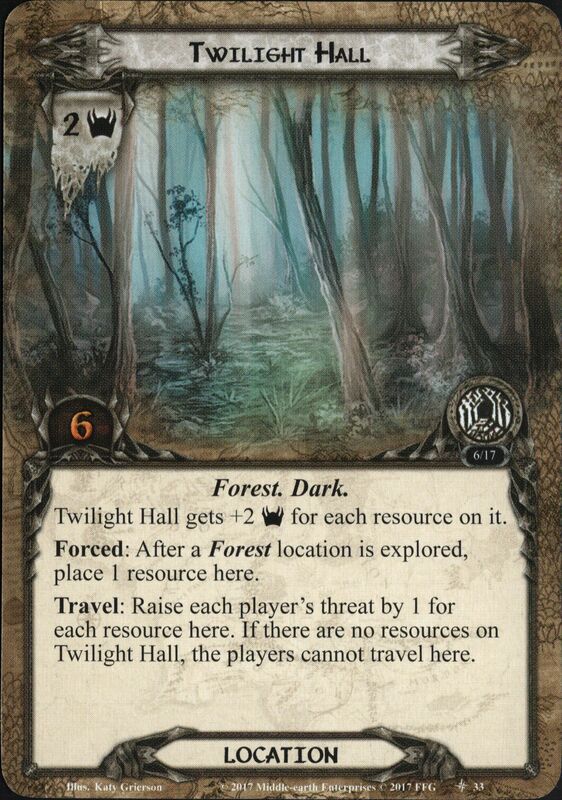 Forced: After a player fails a Hide test, place 1 resource token here. While the players are at stage 1, progress cannot be placed here. While The One Ring is exhausted, Weather Hills gets +2 Threat. 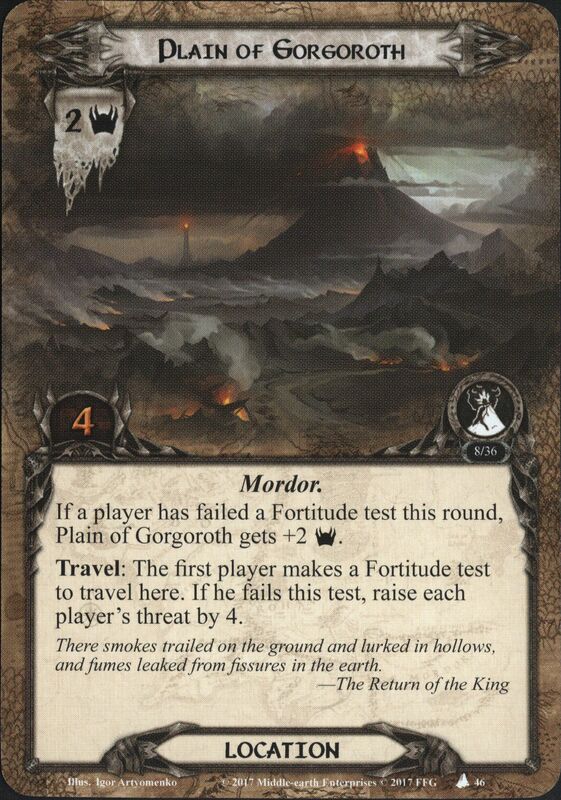 While Fortress of Isengard is in the staging area, each Orc enemy gets +1 Threat, +1 Attack and +1 Defense. Wizardry: Return the topmost enemy in the encounter discard pile to the staging area. 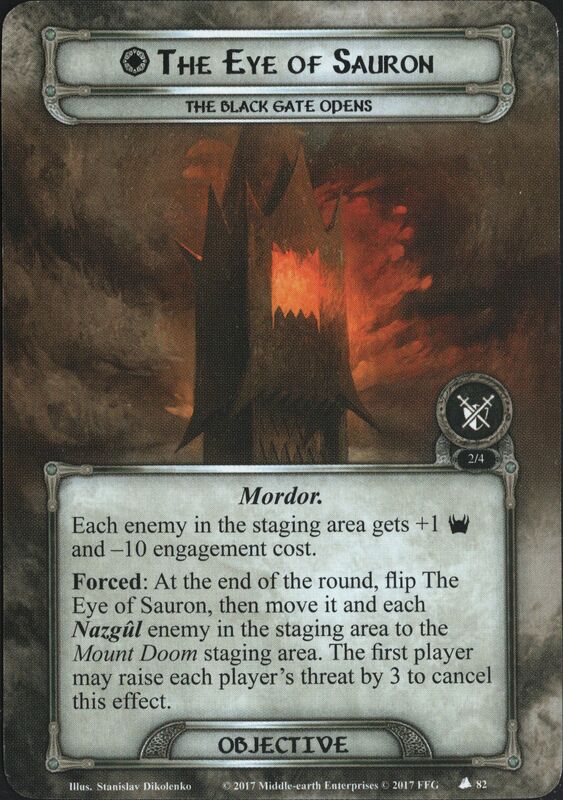 When Revealed: Until the end of the round, each Harad enemy in the staging area gets +2 Threat, -30 engagement cost, and cannot be optionally engaged. Immune to player card effects. 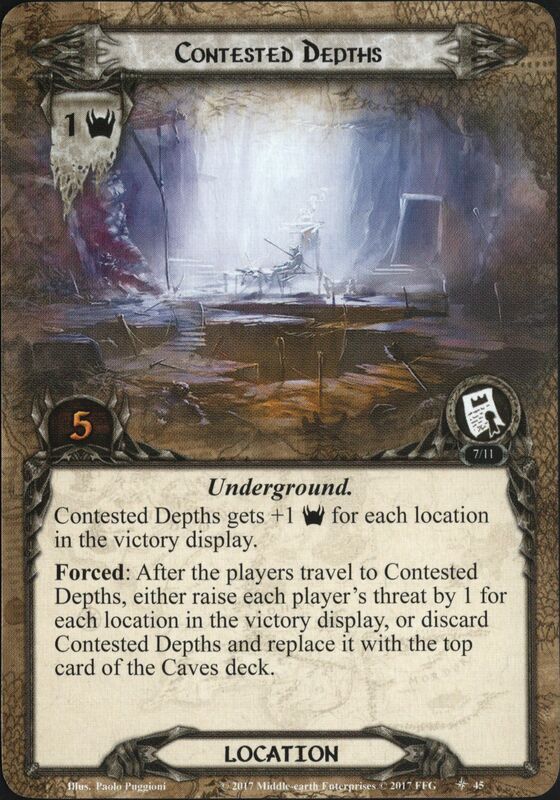 While Cobwebbed Tunnel is in the staging area, each Underground location in the staging area gets +1 Threat and +5 quest points. 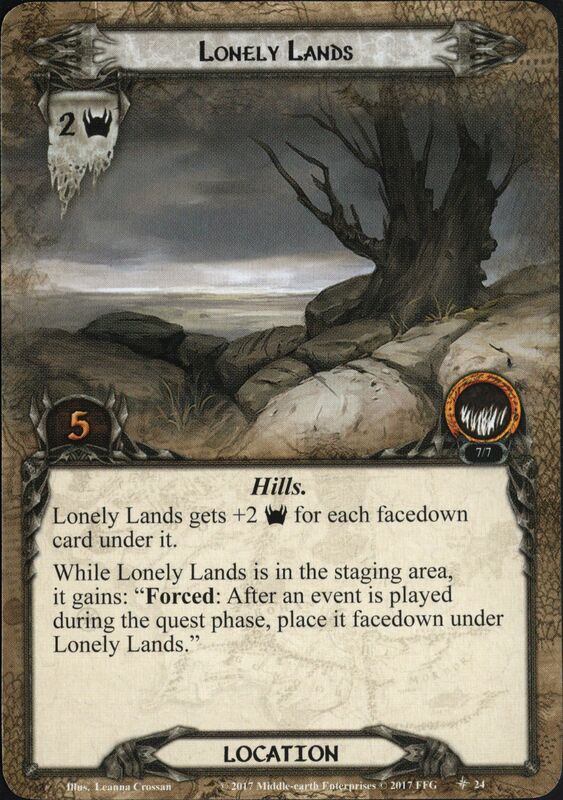 Travel: The first player reveals an encounter card to travel here.